So, I don't see one of these out there and I'm just about to start off my Thousand Sons project. There is only one unique thing with Thousand Sons to talk about so far, and that's the relic! I would imagine a bike or cataphractii HQ with it to dish out some punishment! Do you guys take Furious Charge or Stubborn for your Thousand Sons? Personally I'd go stubborn, just feels right for me. How do you find it is playing without legion rules? Yeah, their relic is pretty boss. S10 vs LD10? Yes please! And it doesnt even take a weapon slot! even better. Between Stubborn and FC, for Thousand Sons you could go either way. FC is easily justified with them amplifying their physical strength with their psychic mumbo-jumbo. As is stubborn due to their mental fortitude. 6 shots at 12", S10 against Ld...which is often lower. I'm guessing that it goes after majority Ld, just as normal weapons go after majority T. Isn't that how the 40k grav weapons does it with armour? ...though, does it use Ld or T to calculate ID? I assume it only calculates to-wound on LD and ID is still linked to toughness vs weapon strength. I use stubborn. Only because I have no assault units to speak of currently. I did have my Librarian perils himself though, always seems to happen..... So my tactical advise is don't perils. That's about as deep as my tactical advise goes, having only played 1 heresy game so far. I'd say run them as word bearers rn with the burning lore upgrade. Have FW said anything about TS librarians? I think even though they have the support officer rule, they should be allowed to be the main HQ if they are ML3. Until they get rules at least. There is no ML3 anymore. It was changed in the Red Books. Oh man, really? I am only going on betrayal as that's what is on my phone. Damn shame. If your gaming group allows it, I'd make my own rules - for example I had a legion special rule that they could take a third mastery level, which drops the support officer rule and gains the Master of the Legion special rule. However, due to the cult nature of the TS, you can only roll on one table for psychic powers. I'd Houserule it to be something like the Iron-Father, i.e. an upgrade for a Praetor only. Same cost as Librarian Consul but up to ML3. That's a great idea about the Cults depthcharge! Thousand sons are supposed to get their own psychic powers in the next book..hopefully!!! I think it's the other way to do them justice. You'll probably have a few levels of them where level one gets a certain pool of weak spells, level 2 gets some stronger and level 3 even more. Edited by khorneguy, 16 December 2015 - 12:47 PM. Interesting, though I'm curious what your plan is against vehicles? What does your meta look like? The skimmers are there to hunt down vehicles, plus the Melta/Grav Dread can take on that role too. The meta in my area is mostly infantry or Infantry in Rhinos atm though, due to the release of B@C. I'll probably bump up my anti-tank once the local players start buying heavier stuff! Edited by khorneguy, 16 December 2015 - 12:48 PM. Has anyone found a good use for the relic? It's a costly upgrade, requires Relentless to be used properly, and most models it is available to want to do one shooting round and then assault. I haven't used it yet since my TS forces are still under construction, but I have a plan of using a jetbike librarian with the relic. Psychic shriek to get rid of any tanking sergeants and such, and then 6 shots ap3 wounding on 2+ in the face, and then assault! I'm curious about using it against mechanicum as well. They don't usually have high leadership, so even Castellax are wounded on 2+! Well I think it is time this had some life into it, if not an official one. New to HH in general, and trying to decide the best way to bide my time. We have teases and hints now, and I have picked up the current upgrade kits. The problem is not knowing what troops and weapons will kind of be our thing. So from those who are more experienced...what should I focus on building now in the mean time with my BAC boxes and upgrade kits that are a safe bet. Also what are the best investments for my next order. I was thinking Legion Champion/Master of the Signal and some Volkite (still up in the air about what size). I would focus on the things that are always good. You will always need tactical or veteran tactical marines. You can always use a double grav-fist Contemptor. So that's what I would use BAC for. Volkite support squads are nice. Alternatively, I would focus on vehicles so you can wait and see what kind of perks and special units the Sons get before you over-invest in infantry. Sicarian tanks, Vindicators, Predators, Leviathans, Deredeos, Scorpius, Medusas, Contemptors, Javelins, Fire Raptors, etc. will always be useful no matter what rules Book 7 brings. This (and Kheres mortis contemptor) is very correct! 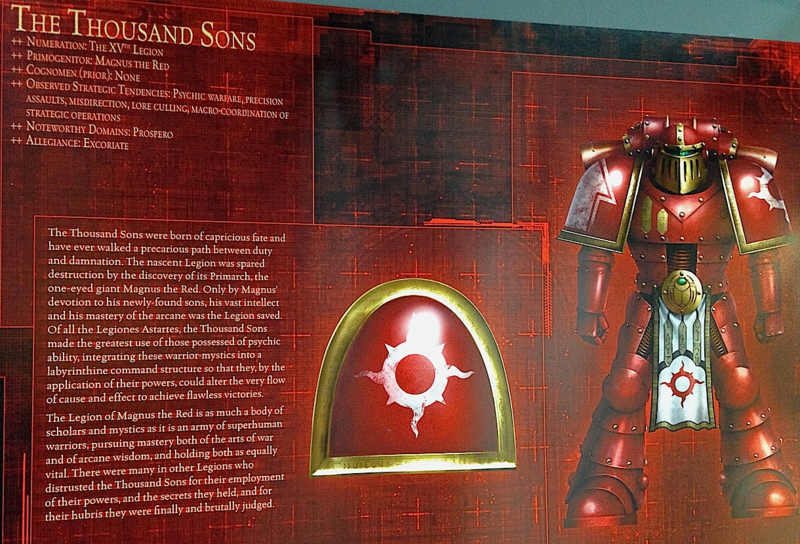 We can expect that our perks will affect models with the Legiones Astartes(Thousand Sons) rules, so any infantry. Limit those ones and you'll be fine for the future. Currently I'm working on 20 regular marines, a few guys with special weps, termies, some fancy HQs and the rest are vehicles. Book 6 sadly didn't bring any real options to the table for the Sons. Librarians are still bleh on their lonesome compared to other HQ options. Relics are in an odd spot and ours wasn't that capable anyway. None of the new rites do anything for them. Of interest though are the Knight-Errants. Rubio is an improved Divination librarian and a better value than the actual vanilla libbies (though with some penalties), but the most interesting options come from the Make-A-Knight kit. You can blend a couple of options together - such as a psychic apothecary or psychic techmarine. I hope this is a sign of things to come for Thousand Sons HQ. Its time to make 30k Psykers great again! But I'm eagerly awaiting more rules for tsons, I bet they're gonna have lots of similarities to Grey Knights. I talked with Athrawes about using the Knights errant and Tylos Rubio rules to count as a strong psyker character for the XVth legion.